Since I had abandoned Nuramoc to make room for the Patch 4.2 rares, I needed to go out and tame a new Chimaera. Considering I’d been wanting to trade my pink and purple model in for the amazing new blue and white model of The Razza anyway, I was on my way to Feralas quick as you please. 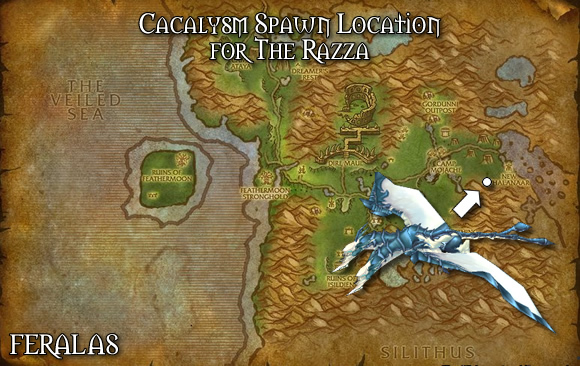 In addition to his awesome new skin, another of the changes made to The Razza for Caytaclysm is his spawn location. If you’re a BM Hunter looking to add this cool beastie to your stable, don’t refer to the map on WoWHead, as it’s still showing his old spawn location. His coordinates are approximately 84.0, 50.0 — right smack in the middle of a Gnoll camp. Taming him is no trouble at all, given that you have to be 69 in order to get him (with the Beast Mastery talent), and he’s only level 40. After giving the Chimaera another chance, I have to say that I’m pretty happy with it. I’ve also tweaked my PvP build some, which maybe is adding to my overall experience in BGs. I’ll post on that soon. Chimaeras have a ranged slowing ability called Frost Breath which is helpful for kiting enemy players, as well as for slowing enemy flag carriers. The other ability they have is something I’m not real sure if I like just yet. Rather than provide a buff, Chimaeras have an AoE ability called Froststorm Breath. It deals AoE frost damage in a fairly small frontal cone. The ability does decent damage and each of its four ticks can crit, however, it is a channeled spell and cannot be interrupted. The problem I have with it is that during the casting of Froststorm Breath, the Chimaera cannot cast any other abilities – including Dive. This also means no Wolverine Bites, no Bites, no regular attacks, no Frost Breath, and if you cast Kill Command during a Froststorm Breath cast, it will interrupt it. In short, I see it as a situational ability for PvP. It could probably have some fine uses for PvE, for added AoE DPS, but using it in PvP seems to be a DPS loss, as far as single-target damage is concerned. So far, the only times I could see using it would be: when trying to flush out a nearby stealthed enemy, when facing an enemy with high physical damage mitigation, or when trying to AoE a group of enemies trying to capture a flag in a BG. I’m sure after more testing I’ll find some other uses for it, but those are a few situations that come to mind. Froststorm Breath does do some decent damage during Bestial Wrath, and as I’d mentioned each of the four ticks can crit. I was seeing crits in the 8.5K range quite often, with some casts doing around 25K damage total. Considering you can sandwich it between two Kill Commands during Bestial Wrath, that translates to about 7 seconds worth of pretty insane pet damage. One thing that kinda blows about Froststorm Breath is its relatively small range. You have to be within 7 yards of your target, and the cone extends maybe only 15° in either direction, so it’s a fairly small AoE. I think the ability could be improved considerably if the range were extended to say 15 yards, and given a 90° frontal cone. The image below shows what the actual range looks like in-game. Another thing to note is that the Froststorm Breath ability needs to be micro-managed, as it cannot be auto-cast. I think to get the most from the ability, it will require some experimenting with it, but all in all… I’d say that the Chimaera is a fine choice for a PvP companion, even if only for its ranged slowing ability (Frost Breath). In closing, I highly recommend The Razza for BM Hunters looking for a good PvP pet. He can be easily nabbed at level 69, he looks great, and as outlined in this guide… he has some nifty abilities. Any of you use a Chimaera regularly for PvP? How do you like it? Just picked up The Razza after missing out on Skoll. Going to be using The Razza, Arc, Gondria, and a Corehound, and Devilsaur at MOP launch! Thanks for your guides! Happy hunting everyone. I got this pet yesterday, did some BG and think this pet gonna be really good once you get used to his abilities. However hadn’t thought about using him for flag defence in Rated BGs. I’ll try him there. Another thing to note is that, very much unlike Nuramoc, he only sits in one place in that Gnoll camp and never moves at all. The real problem is finding the path to the encampment, as the entire area before it is filled with PvP-flagged Nelf guards, and the path itself is hidden behind a few rock cliffs and a lot of trees. The guards are preoccupied with fighting off Grimtotems anyway, but just make sure you don’t aggro one as you pass by. I really only use the froststorm breath when defending against enemies who are trying to capture a flag, and even then I’ll often use Multishot to prevent the cap, while allowing the Chimera to do single target DPS. It comes in very handy when CCed, or out of foucs, or if there is a smokebomb on the flag. Note I’m mostly talking about Rated BGs here, when LONG portions of the fight involve keeping clusters of enemies from capping the flag (especially in Battle for Glineas, and typically at the Blacksmith in Arathi Basin). Still, in those limited situations, it’s an amazing ability. And the slow is useful. I find teammates often provide the major DPS buffs anyway (Agi and Crit and Kings/Mark of the Wild). I suppose it would also be great when facing a cluster of enemies, especially during Bestial Wrath. I’ll have to try that. Chimera’s are also great to just sic on the enemy FC and keep them permanently slowed without having to constantly hit them with Concussive Shot. I have this Chimaera and have used it quite a bit for PvP. The frostbreath has a little bit of a range on it so it was able to get on my target a little faster than the web wrap of my spider. I really liked it in my few attempts at arena – he zipped across the space in no time at all and slowed down the DK/Mage/Warrior coming to sit on me. Never said I was any good at arena but the pet was great!